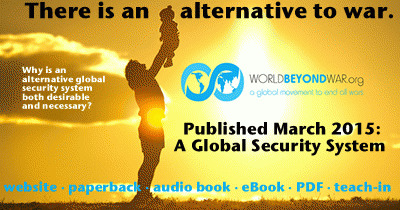 World Beyond War has just published a short book titled A Global Security System: An Alternative to War. This act constitutes an intervention into the debate over whether to create a new Authorization for the Use of Military Force. In fact, this document should help stimulate a debate over whether to continue with the war approach to global conflicts, authorized or not. It has become routine to acknowledge that "there is no military solution" even while pursuing military actions as preferable to doing nothing. A Global Security System builds a case for alternative actions, both in a moment of crisis, and on the long-term path toward preventing conflict and developing nonviolent means of resolving conflict. "In On Violence, Hannah Arendt wrote that the reason warfare is still with us is not a death wish of our species nor some instinct of aggression, '. . . but the simple fact that no substitute for this final arbiter in international affairs has yet appeared on the political scene.' The Alternative Global Security System we describe here is the substitute. The goal of this document is to gather into one place, in the briefest form possible, everything one needs to know to work toward an end to war by replacing it with an Alternative Global Security System in contrast to the failed system of national security." The book is available free online at WorldBeyondWar.org, including the Executive Summary and full Table of Contents. Here is the full PDF version. The paperback is available at your local bookstore or any online bookseller. The distributor is Ingram. The ISBN is 978-0983083085. Buy online at Amazon, or Barnes and Noble. The audio book can be purchased here. The eBook editions (978-1495147159) are coming soon. Comments can be posted under each section of the book on the WorldBeyondWar.org website. Some of the top experts in various fields will be engaging in conversation in these comment sections. Each book section is posted along with graphics, an audio version, and related actions that can be taken. Check it out! A teach-in on this topic is planned for 5:00-6:30 p.m. March 20, 2015, at University of the District of Columbia Law School at 4200 Connecticut Avenue NW, Washington, DC, as part of four days of events planned by Spring Rising. Speaking will be David Swanson, author and director of World Beyond War; Matthew Hoh, a former State Department official who resigned in protest from his post in Afghanistan; and Robert Fantina, author and journalist whose most recent book is Empire, Racism and Genocide: A History of U.S. Foreign Policy.